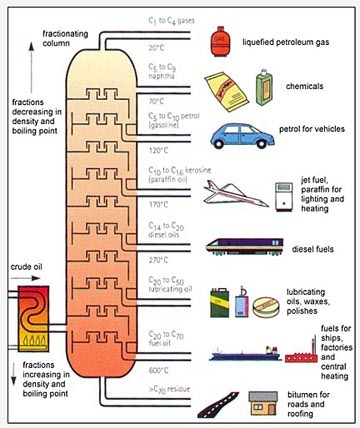 Petroleum is refined into 8 fractions, as shown in the diagram. Each of these has a different application and some are more easily degraded than others, either by the sun or bacteria. For the purposes of this article, I’ve remained general, as many of the pathways are similar and effects consequently similar. However, each chemical fraction and metabolite can and do have slightly different effects, making some more of a concern to human health than others. A review in 1977 by PJ King was one of the first to point out potential impacts to human health: polycyclic aromatic hydrocarbons produced naturally by some vegetables but largely by industrial pyrolysis bioaccumulate and thus cause a cancer risk through ingestion. Previous studies had assumed that because of the low solubility of PAHs they would not pose much risk. This is after the first description of the chemical risk posed by petroleum outside of the big spill events. Since then, the various chemicals have been identified in sediments from around the world with varying effects. The myriad articles on how specific individual chemicals effect specific species creates a huge literature that is unwieldy to learn and at times outdated with our current understanding of ecosystem ecology. Few attempts have been made at synthesizing for a particular location or system as a whole. A mangrove spill in the Phillipines. Thanks Greenpeace. One notable study is centered on coastal Brazil by daSilva et al. Using levels of parrafinic hydrocarbons as an indicator, they found that petroleum contamination was somewhat spatially limited to areas near drill sites or refineries. Fish from all along the coast were found to contain up to 11.7 ug/g of PAHs in their edible tissues (black jack). Brazil’s coastline alternates between flat, sandy beaches and mangrove forests. Mangroves are extremely important for fishery nursery grounds and a worldwide conservation priority. 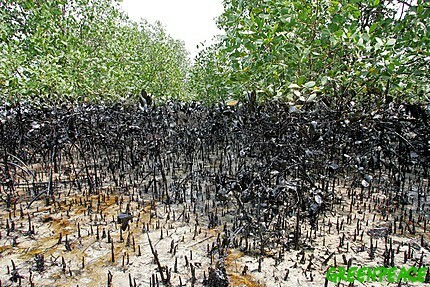 Mangrove trees exposed to “oil accidents” such as ship leakage, tanker washing, and pipeline leaks were shown to defoliate or lose leaf color and drop buds. Effects took up to a whole year to fully manifest. Litter crabs were observed to be absent from the site for 10 months before new colonizers returned. Overall, energy flow through the mangrove system was shifted to a lower-flow state. In addition, the Uca species living in the area could not find their burrows or even fighting for an already occupied burrow at a physical disadvantage. Seabirds eating predominantly fish from accident sites were observed to lose their ability to fly or float. Those that survived showed adenal hyperplasia, liver degeneration, and pneumonia. The fat tissues included in eggs were shown to have lethal levels of PAHs for the embryos, having significant demographic effects even for wide-ranging shorebirds. The Brazil review didn’t quite get to fish, which have some serious concerns given the documented bioaccumulation of some byproducts. A review in 1981 by Malins and Hodgins determined that certain compounds accumulated up to 9000 times the ambient water levels. Overall tissue byproduct levels decrease over time, especially in areas with a history of oil contamination, however some of the metabolites are actually more toxic than the original contaminant. For example, benzo[a]pyrene is activated and binds to DNA, later causing tumors. In addition to lethality, contaminant levels were also associated with behavioral changes such as salmon failing to swim up fish ladders and skeletal abnormalities in developing sole. The Sierra Club Presents: WhySharksMatter! Fantastic as always, keep up the radical work!